The First Quarter Moon is Saturday February 4. Venus is prominent in the twilight and early evening sky in the star poor regions of Aquarius. Mars is just above Venus. 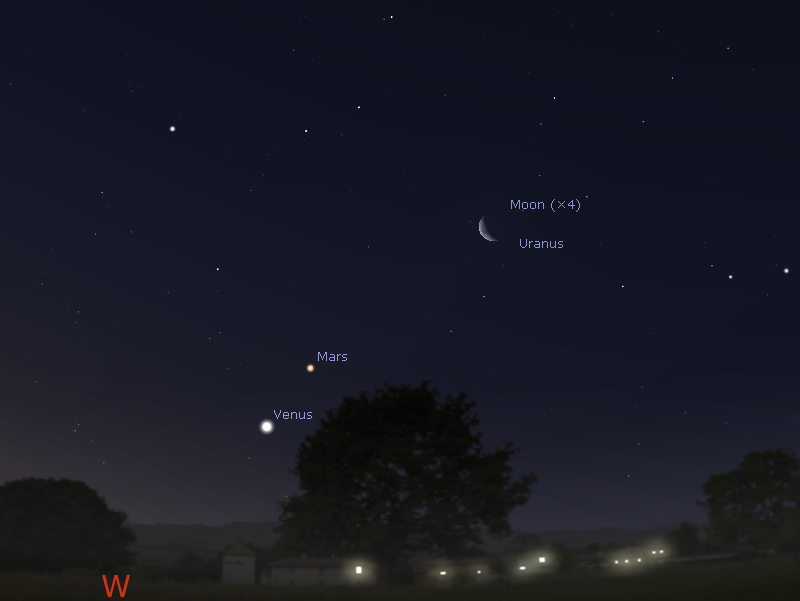 The crescent Moon forms a line with Venus and Mars on February 2. 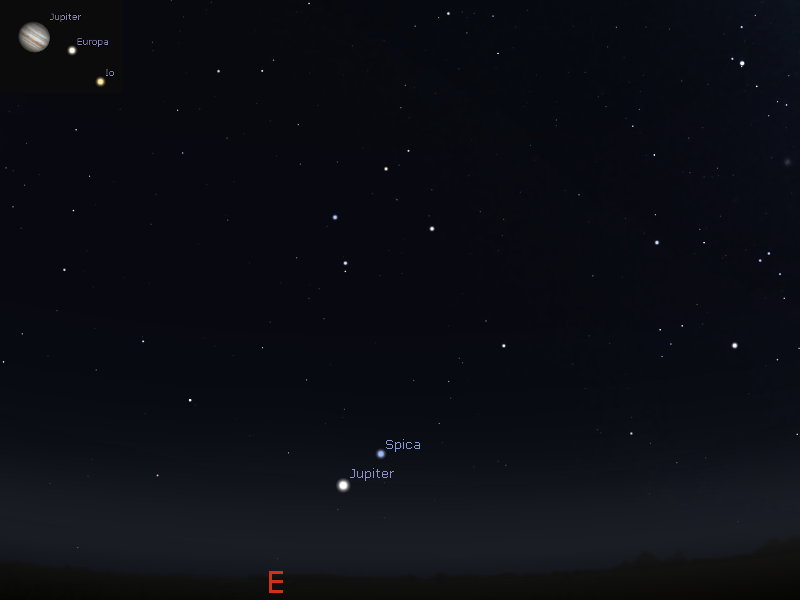 Jupiter and the bright star Spica are close in the morning skies with Saturn and Mercury close to the horizon below. Asteroid Vesta visible in binoculars. The First Quarter Moon is Saturday February 4. The Moon is at perigee, when it is closest to the Earth, on the 6th. Evening sky on Thursday February 2 looking west as seen from Adelaide at 21:25 ACDST (60 minutes after sunset). Venus and (now dim) Mars form a line with the crescent Moon. Venus is high in the dusk sky and intensely bright. It can be seen easily from somewhat before half an hour after sunset to two hours after sunset. It stays dazzlingly brilliant above the horizon in truly dark skies well into the evening. Venus has been mistaken for flares or landing aeroplanes it is so bright now. Venus is in a very star poor field in Aquarius. Venus is a distinct "half Moon" shape in telescopes. On the 2nd Venus, Mars and the crescent Moon form a line. Mars is in the western evening skies in Aquarius, close to the Aquarius/Pisces border. Mars remains in a star poor area. 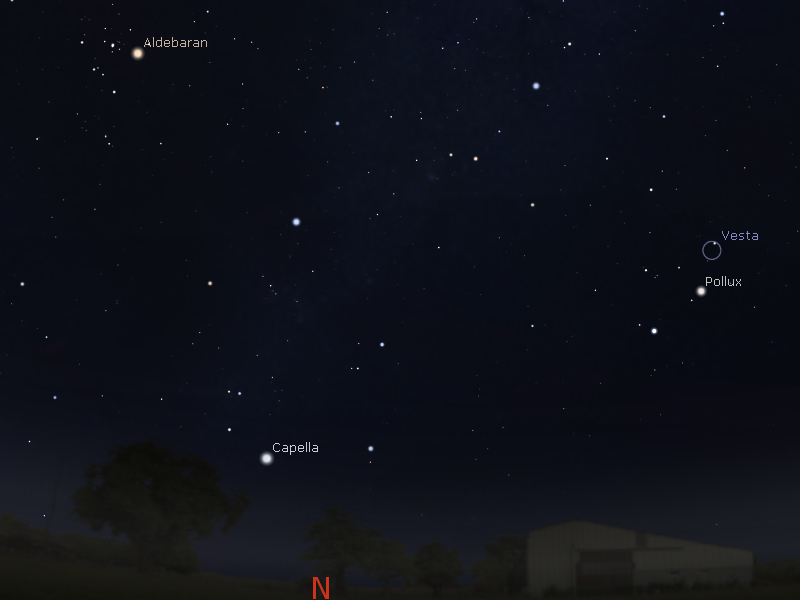 The North-east horizon as seen in Australia at 22:00 pm ACDST (an hour and a half after sunset) showing the location of Vesta on Saturday February 4 (similar views will be seen elsewhere at the equivalent local time, and hour and a half after sunset, click to embiggen). The asteroid Vesta is just past opposition, and this is a excellent time to see one of the biggest asteroids in the solar system. At magnitude 6.5 it is easily viewable in binoculars. 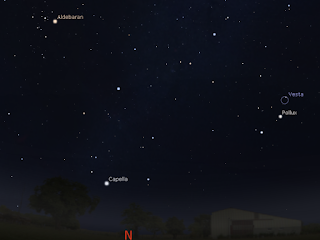 It is above the north-eastern horizon, and the bright stars of Gemini, Castor and Pollux, point to it. Over the next few nights it will be very close to kappa (𝛋) Geminorium, making Vesta very easy of find. Kappa (𝛋) Geminorium is the next brightest star in almost a line with Castor and Pollux, which makes it a easy telescopic signpost. You may need to watch night to night as the asteroid moves to be sure of its identity. For more details and a printable map see this page. Sky on Saturday February 4 looking east as seen from Adelaide at midnight ACDST. Jupiter is now rising before midnight. It is close to the bright star Spica. The inset shows Itelescopic view of Jupiter at this time. Similar views will be seen elsewhere in Australia at the equivalent local time. (click to embiggen). Jupiter rises even higher into the morning skies this week. 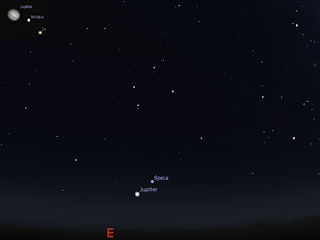 It is now well above the eastern horizon and is easy to see as the brightest object above the northern horizon from around an hour and a half before sunrise. It is also riging just before midnight, but remains low to the horizon this week. It is close to the bright star Spica, the brightest star in the constellation of Virgo. Jupiter is a good telescopic target from around 1 am, and the dance of its Moons is visible even in binoculars. The following Jupiter events are in AEDST. Morning sky on Saturday February 4 looking east as seen from Adelaide at 5:33 ACDST (60 minutes before sunrise). 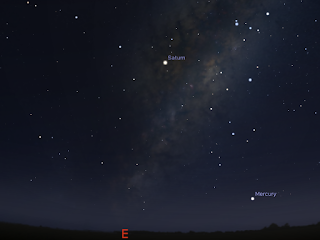 Saturn is reasonably high above the horizon with Mercury just below it . Similar views will be seen elsewhere in Australia at the equivalent local time (60 minutes before sunrise). (click to embiggen). The constellation of Scorpio is a good guide to locating Saturn and Mercury. The distinctive curl of Scorpio is easy to see above the eastern horizon, locate the bright red star, Antares, and the look below that towards the horizon, the next bright object is Saturn, followed by Mercury. Mercury is slowly returning towards the horizon but is still readily visible this week.